Thin Mints, Samoas, Tagalongs, Trefoils, Do-si-dos, Savannah Smiles, Mango Cremes With Nutrifusion™, Tagalongs™ Snack Bars, Double Dutch Snack Bars. 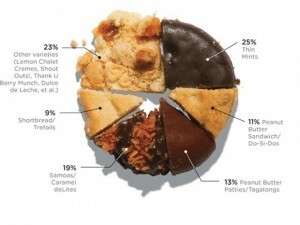 All Girl Scout Cookies have 0g trans fats per serving, and are certified kosher (U)-Dairy. New this year! This sandwich cookie has a touch of cinnamon-ginger spice that evokes the warmth of a fireside chat on a snowy evening. The cookie sandwich features a mango-flavored filling amongst vanilla and coconut cookie shells.